CALGARY - Canada's run for gold begins with a wide open competition for spots next week, as Hockey Canada named its selection camp roster on Wednesday in preparation for the 2018 World Junior Hockey Championship. Hockey Canada named 32 players - 18 forwards, 10 defencemen and four goaltenders - to its selection camp roster in St. Catharines, Ont. Seven players return from last year’s team, including Flyers goaltending prospect Carter Hart (Everett, WHL), Los Angeles Kings blueline prospect Kale Clague (Prince George, WHL), along with forwards Michael McLeod (Mississauga, OHL) of the New Jersey Devils and Tampa Bay's Taylor Raddysh (Erie, OHL). That leaves 16 spots up for grabs as Hockey Canada will trim the roster down to 23 players. "When you start taking out some prominent guys on defence and some potential No. 1, No. 2 and No. 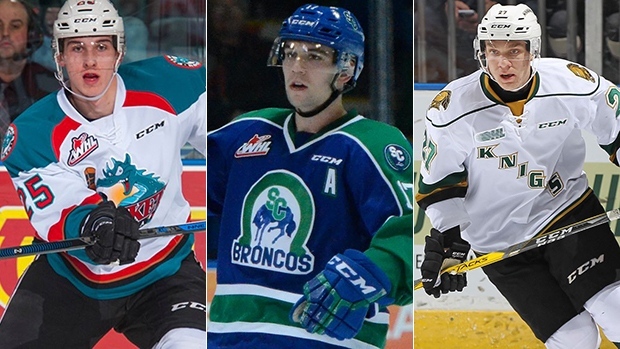 3 centres amongst the forwards, it opens things up for the camp," TSN Hockey Insider Bob McKenzie explained this week. "I think there are going to be some very good players that attend this camp, but it might lack a little bit of star power and I think this is a camp that you would look at and say that there's a high degree of sensitivity...that is, a really good performance by somebody could launch them right into the picture, a really poor performance in the camp could knock them out." Other returnees include Calgary Flames prospect Dillon Dube of the Kelowna Rockets, Carolina blue-chipper Jake Bean (Calgary, WHL) and Nashville blueline prospect Dante Fabbro (Boston University). Canada lost in heartbreaking fashion in last year's gold-medal final, edged in a shootout by the United States at Montreal's Bell Centre. "The last few shots, I couldn't even look at the ice," Fabbro told TSN this week. "I was pretty nervous and didn't know which way it was going to go...we had chances to win that game, but we ended up falling short." Other notable players joining the eight returnees at selection camp are OHL leading scorer Jordan Kyrou (Sarnia), WHL leading goal scorer Tyler Steenbergen (Swift Current), Regina Pats centre Sam Steel and Memorial Cup-winning goaltender Michael DiPietro of the OHL's Windsor Spitfires. The camp roster also has 11 first-round picks, including five from last June's NHL Draft - Colorado's Cale Makar, Cody Glass and Nick Suzuki of the Vegas Golden Knights, Tampa Bay Lightning prospect Cal Foote and St. Louis prospect Robert Thomas. There are a good number of junior-eligible NHL players who are not listed on the roster, including Arizona blueliner Jakob Chychrun, Canadiens defenceman Victor Mete, Columbus Blue Jackets centre Pierre-Luc Dubois, Flyers centre Nolan Patrick, and defenceman Samuel Girard and centre Tyson Jost of the Colorado Avalanche. Though most of these players will likely stay in the NHL, teams have until Dec. 19 to decide whether or not to loan them to the tournament. Selection camp begins Tuesday in St. Catharines, Ont. and runs through Dec. 15. The camp includes games against a team of U Sports All-Stars on Dec. 13 and 14 and an exhibition game against Denmark on Dec. 15 before the final roster is announced. Canada opens the World Junior Tournament in Buffalo on Boxing Day against Finland.